California State University, Fresno is now accepting applications for Fall 2019. The application filing period is October 1st - October 30, 2018. Students can apply online here. To sign-up for one of the workshops, click here. Questions may be addressed to Admissions at (559) 278-2261. California Community Colleges is the largest system of higher education in the nation, with 2.1 million students attending 114 colleges. With a wide range of educational offerings, California Community Colleges provide workforce training, basic courses in English and math, certificate and degree programs and preparation for transfer to four-year institutions. Search Salary Surfer to view combined median earnings of those who completed a certificate or degree in 179 of the most widely enrolled programs at community colleges. This is a message from the Clovis East High School Counseling Team. 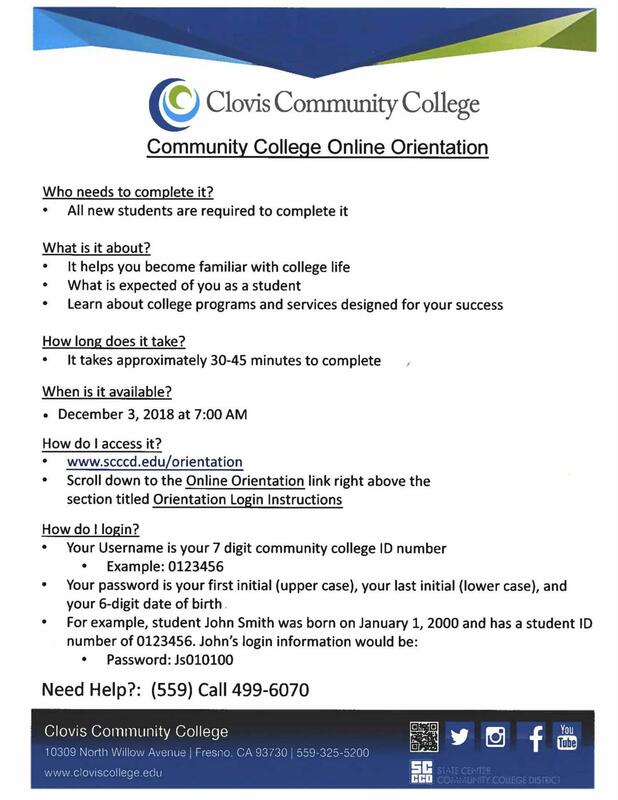 On 12/4 & 12/5 this week the Counseling Center hosted the Clovis Community College online Orientation for all our Seniors. If your Senior did not come to this orientation, please note that there is still time to complete the orientation at home online. 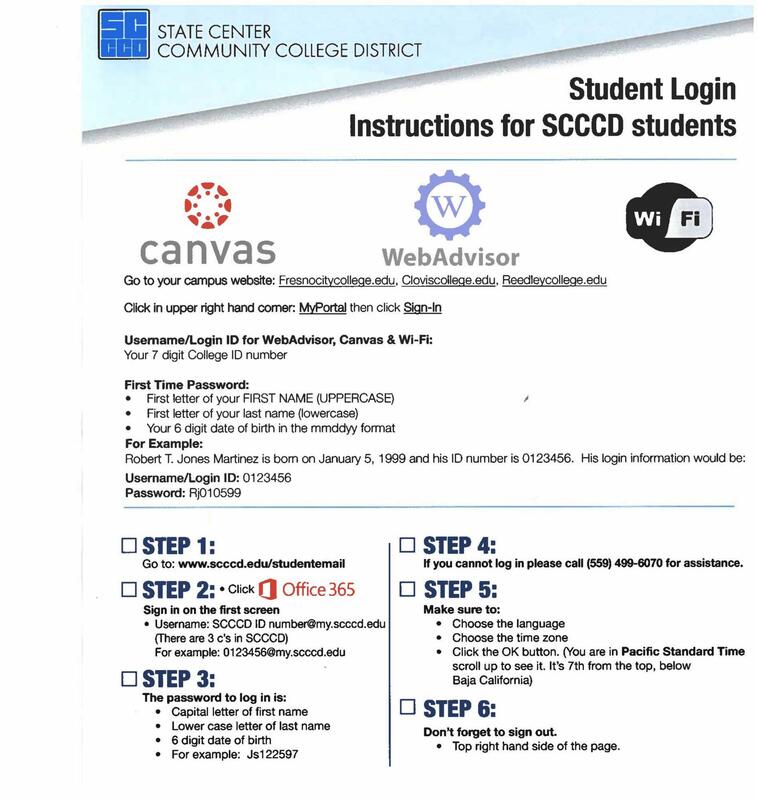 For more information please visit our website at rec.cusd.com under counseling and find the document to assist your senior with completing this process. 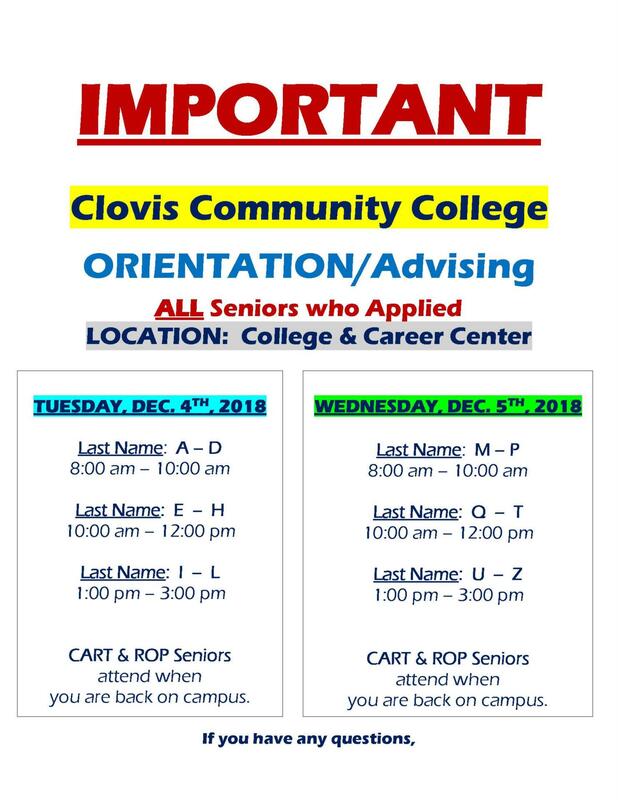 If you have more questions, please contact your child’s counselor at 559-327-4142.Remember, the sooner your child completes this process, the sooner they will be able to pick their classes. With 23 campuses, CSU is the largest, most diverse, and one of the most affordable university systems in the country. Fresno State, Cal Poly SLO, Cal Poly Pomona, and San Francisco State are popular CSU campuses for Clovis High graduates. Many CSU campuses have higher standards for particular majors or for students who live outside the local admission area. Because of the number of students who apply, several campuses have higher standards (supplementary admission criteria) for all applicants. Make sure to learn about admission requirements early in your high school career. Early Assessment Program (EAP): In the spring, all 11th graders participate in the California Assessment of Student Performance and Progress (CAASPP) in English Language Arts/Literacy and mathematics. Students will be given their EAP results during their senior year, which will be used to determine their readiness to take college level English and math courses before attending a California State University (CSU) or one of the participating California Community Colleges (CCC). EAP results are not used for admission. LEARN MORE. The Fall 2019 freshman admissions application period is October 1 - November 30. Fresno State Ambassador, Adreina Torres, will be in the Counseling Center on Wednesdays (11:30am - 3:30pm) and Thursdays (8:00am - 3:30pm). The Fall 2019 freshman application opens August 1. Applications must be submitted October 1 - November 30. University of California (UC) admission guidelines are designed to ensure you are well-prepared to succeed at UC. If you're interested in attending a UC campus, it is very important to exceed the minimum eligibility requirements in order to be a competitive applicant. 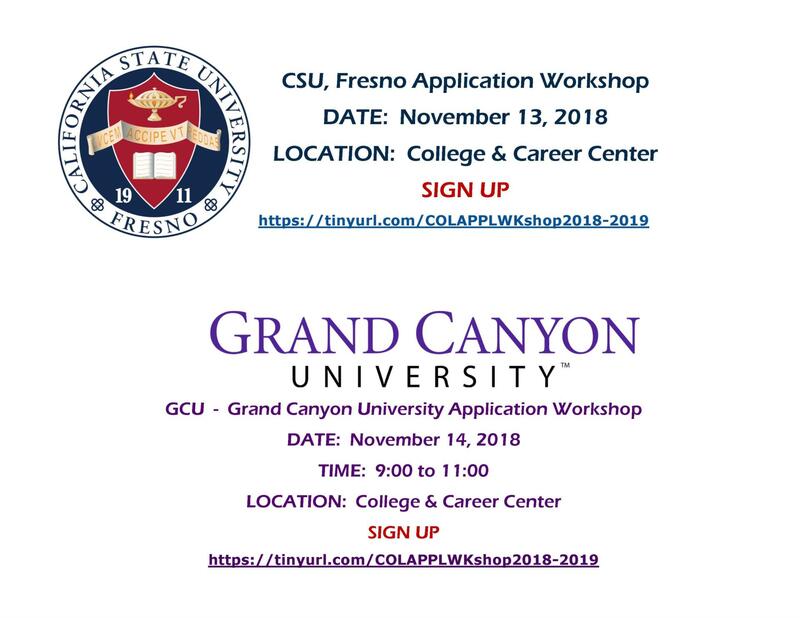 Several UC Application Workshops will be held at the UC Fresno Center throughout the fall. At these events, a UC Merced representative will meet with students to share an in-depth description on how to fill out the UC system-wide application, what the applicant needs to know about the factors that UC Admissions considers, what to avoid, and to clear up any confusing aspects of the application. It will also give a thorough discussion of the Personal Insight Questions, what is important to include, and what not to say. Search "UC Fresno Center" events and register early! There are hundreds of private colleges and universities from which to choose. There are 70 independent undergraduate colleges and universities in California alone. Private colleges and universities are quite diverse in nature, including research universities, small liberal arts colleges, faith-based colleges and universities, and specialized colleges. The cost is higher than public colleges and universities. However, these institutions have a variety of financial aid programs that often make the cost comparable to a public institution. Your ability to graduate in 4 years at a private institution may be greater than at a public institution due to more courses being available to you as a student there. Some independent institutions, such as USC, Stanford, and California Institute of Technology, are highly selective. Other universities are less selective in nature. Visit their websites for specific admission information and application deadlines. In many cases, transfer to a private college is possible after your freshman year at a community college or other institution. To explore private schools outside of California, we recommend using the search tool in Career Cruising. Many private colleges accept applications through the Common App. There are 105 Historically Black Colleges and Universities (HBCUs) across the nation. While the 105 HBCUs represent just three percent of the nation's institutions of higher learning, they graduate nearly 20 percent of African Americans who earn undergraduate degrees. HBCUs were created to support African American students but these institutions of higher learning are no longer exclusive for African American students. Today, HBCUs have a significant percentage of non-African American student populations that consist of Asian, Hispanic, International and white American students. There's no magic formula for choosing a college or deciding on a future career, but exploring your options in Career Cruising is a great place to begin. Career Cruising is a complete college and career planning program that is FREE for all Clovis East students. Explore colleges, take career assessments, search and apply for scholarships, find jobs, and more! What are you waiting for?